Cambodia is a Southeast Asian country measuring over 180,000 square kilometres, with a population of more than 15 million and bordered by Thailand, Laos and Vietnam. This is a nation with a history as long as it is tempestuous. Once ruled by the mighty Khmer in the 15th Century, the fall of Angkor in 1431 and multiple invasions from neighbouring empires were the first of many Cambodian trials and tribulations over the next half-millennium. Colonised by the French in the 19th Century, it then fell victim to the Vietnam Conflict and suffered numerous bombings by the USA. This lead to a horrific civil war and a brutal Khmer Rouge regime, with the country only starting to recover after the UN sponsored an election in 1993. 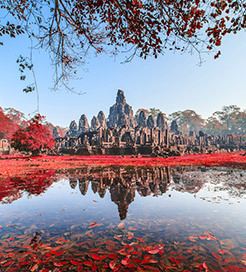 These events have shaped the Cambodia we know today; the locals are famed for their high spirits and welcoming nature towards tourists, and it resulted in some of the most famous landmarks on the continent. Northwest Cambodia displays the ruins of Angkor Wat, a huge stone temple complex unrivalled in all Southeast Asia. A true testament to the splendour of the Khmer Empire, it’s regarded as the 8th wonder of the world, decorated with intricate carvings of guardian spirits and extensive bas-reliefs. The capital, Phnom Penh is known for its art deco Central Market and spectacular Royal Palace, while the National Museum’s historical and archaeological exhibits are not to be missed. This city shows another side to Cambodia, other than glorious temples and idyllic rice fields: a buzzing urban scene, fantastic restaurants and a picturesque riverside location. To the capital, there are daily ferry crossings from Chau Doc in Vietnam, taking you up the Mekong River, the 12th longest in the world. This transnational journey represents a more convenient and scenic mode of transport than flying, lasting only 4 hours on average and operated by a reputable company. For more information, please visit our Ferries from Vietnam to Cambodia page.